HR managers who are responsible for health and safety – listen up. Staples is reporting a big gap in employee awareness of safety plans and preparedness, which could foretell a rise in accidents and injuries. Its survey found that managers were much better informed on such issues than office workers, in general. Most non-management employees were unsure about their company’s safety plan and how to respond in the event of an emergency. 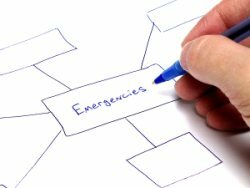 While nearly 70 percent of polled managers were aware of their company’s emergency plan, almost half of office workers were either uncertain of the existence of an emergency plan or reported that their company lacked a plan altogether. Also, half of office workers reported to participating in safety drills only once every few years or not at all. Just 19 percent of office workers believe their company is capable of handling a major emergency. Contrastingly, managers were found to be almost 50 percent more likely to know the location of safety-related supplies such as first-aid kits, defibrillators, and hazard signs. • 70 percent of managers and office workers reported that their company was somewhat to very prepared for a fire. • Half of employees felt that their company would be prepared for a flood. • 56 percent of managers said that they were somewhat prepared to very prepared for a incidence of exposure to hazardous materials. Just 23 percent of office workers said the same.